To view the latest version of this report, visit bsa.org/globalstudy. Computer users around the globe use unlicensed software at an alarming rate, despite being well aware of the associated cybersecurity dangers. 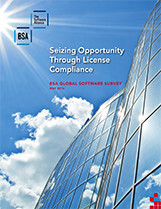 39% of software installed on computers around the world in 2015 is not properly licensed, representing only a modest decrease from 43% in BSA’s previous global study in 2013. Many CIOs simply don’t know how much software employees are installing on company networks. CIOs estimate that 15% of their employees load software on the network without their company’s knowledge, but nearly double the percentage of workers say they are loading software on the network that their company doesn’t know about. CIOs said that avoiding security threats is a critical reason for ensuring the software running in their networks is legitimate and fully licensed. In fact, 49% of CIOs identified security threats from malware as a major threat posed by unlicensed software. Even in certain critical industries, where much tighter control of the digital environment would be expected, unlicensed use was surprisingly high. The survey found the worldwide rate is 25% for the banking, insurance and securities industries. The higher the rate of unlicensed PC software, the higher the likelihood that users will experience potentially debilitating malware. The growing prominence of cloud computing highlights the need to maintain effective SAM programs.